I like to think I teach students to awaken bliss in their bodies from the inside out, while developing an approach to exercise that is healing. I believe that a consistent yoga practice with an honest approach transforms the body and mind. I practice and teach Vinyasa Yoga, adding Iyengar alignment and Pilates for strength. I have been practicing yoga for more than 15 years. I have a 200hr teaching certification from It’s Yoga Thailand and a 50hr advanced certification from It’s Yoga Nicaragua. 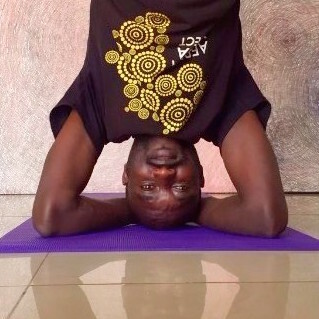 I began teaching yoga here in Kigali in 2012 at Claudine Kalinda’s hot yoga room, that has evolved into Yego Yoga and I’m very proud of our Rwandan and international teachers, you can read about our journey in our news features. A practitioner of yoga faces life not as a victim but as a master, in control of his or her life. Regular practice will bring you to look at yourself and your goals in a new light. It will help remove the obstacles to good health and stable emotions. Yoga helps us to achieve emancipation and self-realization. Yoga changed my life, it brings into my life new possibilities, it helps me to live the present moment and be grateful for each and everything happening in my life. 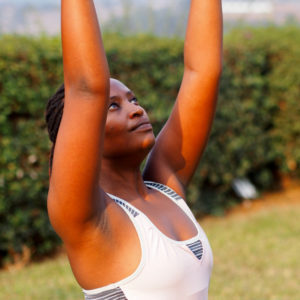 I want to share the benefits of yoga with Rwanda. I teach and practice power vinyasa flow, Vinyasa flow, ashtanga based yoga, Prenatal yoga and Jivamukti yoga. I have been practicing yoga for more than 5 years. I have a 200hr certification from Africa Yoga Project, 200hr certification from Zanzi yoga, 300hr Jivamukti certification , 40hr prenatal yoga from Shanti Uganda and i did a meditation training under World Peace Initiative in Thailand. The blissful point of practicing yoga isn’t when the headstand finally happens, or when a leg slips behind a shoulder. The point of bliss is the same as it is with music, the place where you find yourself comfortable and alive right in the middle of everything. The place where the sound and the silence are one in the same and you are. I can’t remember when I started practicing yoga, but I’m thankful everyday I get to come to the mat. I completed my 200-hour certification in Vinyasa and Hatha in Thailand and practice a dynamic vinyasa flow. I love being part of the growing yoga community in Kigali and hope in some way I can help others find their breath and flow. When I attended my first yoga class, I had no idea that I will learn all I know today from yoga (advanced yoga poses, breathing exercises, meditation). 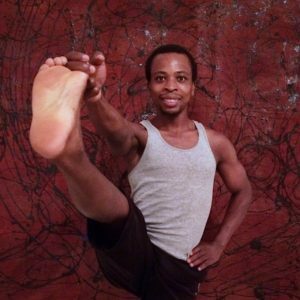 The first yoga class left me curious, asking questions until I became a certified teacher by the Baptiste Institute of Power Yoga after training for 3 years with Africa Yoga Project. I have attended meditation retreats with the Vipassana Organisation and Uganda Buddhist Centre. Just as little by little a bird builds its nest, I learned that from one step after another results a long journey. I have been teaching yoga over 5 years. By means of the posture, the breath and pure intention my teaching adapts to the level and experience of the student to help him/her access more strength and flexibility, energy and relaxation, physical and emotional balance that we are always looking for. I’ve always felt at home with manifestations of spirituality. Maybe more than comfort, it is something that feels inspiring, whole, and yet mysterious. Practicing yoga and Transcendental Meditation feed this exploration by cultivating rituals for reflection. I am grateful to have practiced yoga for the last decade and for the balance it helps to cultivate in my relationships and in myself. Challenged by personal injuries and judgment toward others, changed by new locales, and awakened by thoughtful teachers in the Anusara, Ashtanga, and Prana Flow communities, I seek opportunities to deepen my practice as an offering to be more discerning of myself and of others. 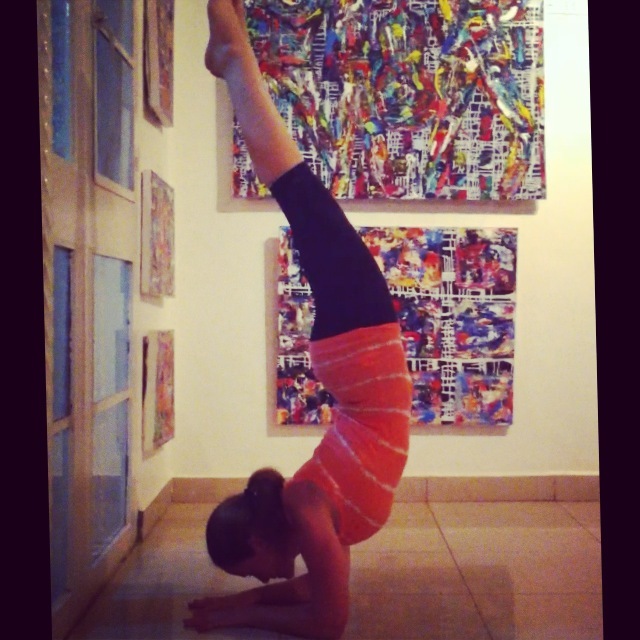 As a yoga teacher, I am thankful for Yego Yoga’s commitment to offering yoga in artistically-inspired spaces in Kigali. Teaching yoga has become one of my fondest rituals. 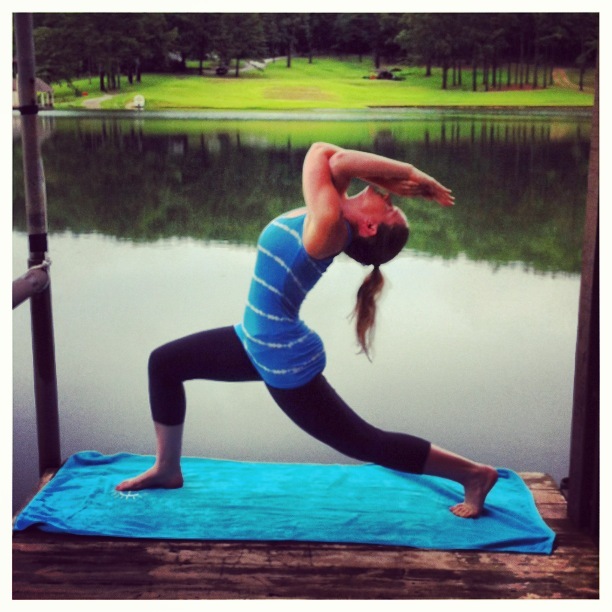 Sarah has been practicing Ashtanga Yoga for almost 15 years. She has trained under many esteemed Ashtanga teachers, including Karyn Grenfell in Melbourne, Zoe Slatoff in New York, both direct students of Shri K Pattabhi Jois. Sarah enjoys teaching as a way of sharing the peace, energy, and inspiration that yoga brings to her with others. She has had the pleasure of instructing students and helping to build yoga communities in Austria, France, Lebanon, and the United States. 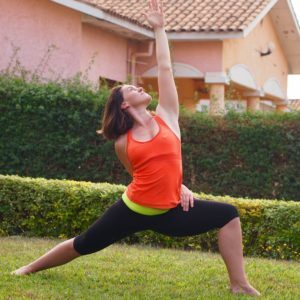 She’s happy to continue the journey of joining yoga communities and sharing her practice by teaching and practicing in Rwanda. The first time I saw yoga I thought it was magic, I could not believe that it came from practice. When I started I was stiff and weak. Now, I have become flexible and strong. It was not easy for me. I focused and I began to meditate every day. I started teaching in 2011 and I decided to dedicate my career to yoga. I have trained for over 6 years in Ashtanga Vinyasa and my teacher, founder of Project AIR, was trained by the original teacher of this style. I have been certified as a yoga instructor by Africa Yoga Project. Yoga has taught me to be truthful and humble, I have learned the values of being helpful and generous. I also teach groups of youth and women with WE-ACTx and Musicians Without Borders. I want to give a positive image of yoga and help Rwandan people understand that it is not magic or mystery, that it is practice. Philosophy: Yoga is the perfect harmony of breath and energy to reconnect with ourselves and balance our busy lives. I find yoga is the ultimate opportunity to practice gratitude and compassion towards others and, most importantly, towards ourselves. Teaching: My classes maintain an energetic flow with a light-hearted approach to body-mind connection. 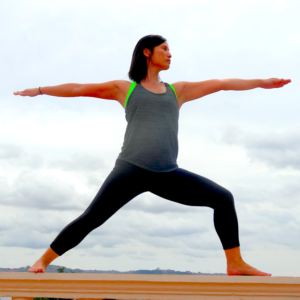 I incorporate extensive upper body- and core-strengthening elements for a challenging and fast-paced practice. Certification and Teaching Experience: I have a strong yoga practice and after a one-month intensive yoga retreat in Zanzibar in 2012, I’ve been teaching power vinyasa flow classes twice weekly.I also received my RYT 200 certification in Hatha yoga from Yog Peeth in Rishikesh, India in spring 2014.